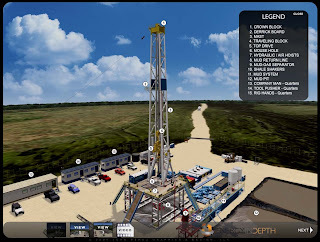 The Energy In Depth web site (an industry site) has a really good set of illustrations showing the various parts of a drill site. Along with the three views of the site (complete with audio explanations), it also has a video of a typical vertical drilling process, complete with a soothing deep-voiced announcer. If you've always wondered what all those pipes and tubes are, this illustration will tell you. Very cool. Great Article by RFK, Jr.
Exxon: "We are really interested in shale gas"